Want to live longer? See your primary care physician! We all know we should be seeing a physician every year for a general health check-up. However, we also know how quickly that “to-do” can take the backseat to all the other pressing issues that daily life brings us. Therefore, it’s not surprising to hear that 21 percent of Americans do not have a primary doctor, according to the 2016 analysis by the Kaiser Family Foundation. 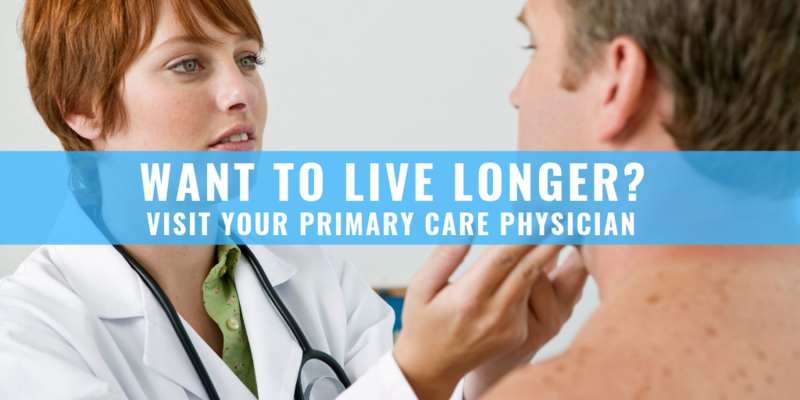 Nonetheless, you might be interested to know that studies have shown that seeing your primary care physician (PCP) can actually help you live longer. When you establish a relationship with your primary care physician they have a general baseline and understanding of your overall health. Therefore, if things start to change with your health, they will be able to pick-up on it sooner. Meaning, you are less likely to die from a disease like cancer, heart disease or stroke. What happens during an annual exam? In addition, you and your primary care physician will talk about how you are feeling on a day-to-day basis. At this point, if you have any health concerns, now is the time to speak up. Are you not sleeping well? Are you feeling depressed or have anxiety lately? Are you trying to quick smoking? All of these things are important for your primary care physician to know – they are here to help you. Also, if you have a pre-existing condition such as heart disease or diabetes, then they will make sure you are maintaining a healthy lifestyle and following the best treatment plan. Finding a Primary Care Physician – Surprise, it’s easier than you think! Firelands Physician Group has 15 primary care physicians, specializing in family and internal medicine, located throughout Erie, Ottawa, Sandusky and Huron County. If you do not have a PCP, simply call (419) 557-5591 and talk to one our friendly staff members who can help find a doctor near you. Or, you can search online using your specific criteria. If you already have a relationship with a primary care physician, then what are you waiting for? Schedule your annual visit today!